The Scholarship/Professional Development Programme will help to create a cadre of professionals who are playing a key role in developing national and regional strategies that will lead to improved disaster risk management and increased climate change resilience. 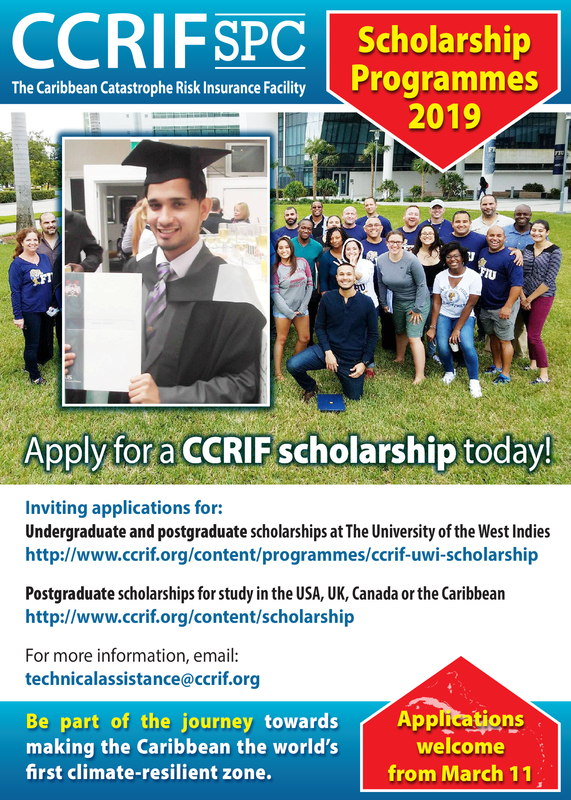 Beginning in 2014, CCRIF will provide a maximum of four scholarships annually for citizens of CARICOM member countries and/or CCRIF member countries who would like to pursue a Masters or an MBA programme in areas related to disaster risk management which is available at universities in the United Kingdom, United States or Canada or at eligible regional universities (other than the University of the West Indies - UWI). This CCRIF Scholarship Programme has replaced the Extra-Regional Scholarship Programme, which was launched in 2012 and provided scholarships for study in the UK, Canada or the USA. Four scholarships were awarded to Caribbean nationals under the Extra-Regional Scholarship Programme. 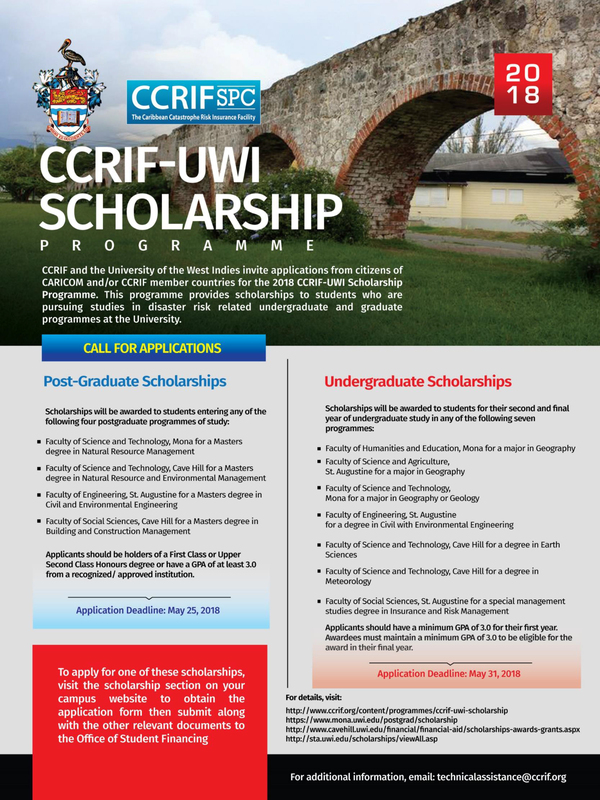 In 2010, CCRIF began its scholarship programme with University of the West Indies (UWI) to provide scholarships to students who are pursuing studies in catastrophe risk related undergraduate and graduate programmes at the University. Since then the Facility has provided a total of 19 scholarships to students at the Mona (Jamaica), St. Augustine (Trinidad & Tobago) and Cave Hill (Barbados) campuses. CCRIF provided support/full scholarships to the Government of Belize for two of its officials employed to the National Meteorological Service to allow them to study for a Bachelor of Science degree in Meteorology at the University of West Indies, Cave Hill Campus in Barbados. CCRIF provides support for ongoing professional development of persons in key regional organisations through their attendance at conferences and workshops. Representatives of the Caribbean Institute for Meteorology and Hydrology, Jamaica’s Office of Disaster Preparedness and Emergency Management and the Cayman Islands Airport Authority have received professional development assistance to attend conferences, workshops and short courses. Through the Regional Strategic Knowledge Building component, CCRIF support its members in the development and implementation of strategies for disaster risk management and adaptation to climate change. Establishment of strategic alliances with key regional organisations. Currently, CCRIF has MOUs with 8 regional organizations which are aimed at developing programmes and other initiatives to reduce existing vulnerabilities in the small island and coastal states of the region. These organizations are: CDEMA, CIMH, SRC, CCCCC, UWI, IDB, OECS and UNECLAC. Implementation of the Economics of Climate Adaptation study in eight Caribbean countries. The local initiatives component aims to support small disaster risk management projects and programmes being implemented at the community level and which contribute to the fulfilment of the CCRIF mandate and the wider comprehensive disaster risk management agenda. 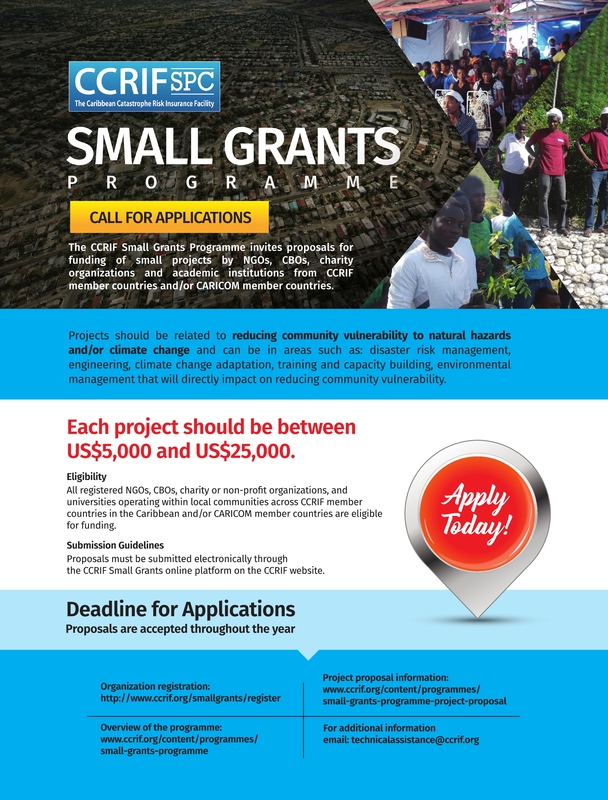 This programme will finance small projects being run by NGOs and charity organisations and/or mandated by national disaster coordinators in local communities across CCRIF member countries. All projects must be of relevance to CCRIF and its regional mandate and agenda and can therefore be inclusive of but not limited to projects related to the following broad areas: disaster risk management; engineering; climate change adaptation; and training and other capacity building.